Sufiana Qalaam By Wadali Brothers is an event that took place on 28-Apr-2007 in Hyderabad. And among the several graceful ways to spend this Saturday night in town, is the company of a pair that won the Sangeet Natak Akademi Award way back in 1991. The Annual Golconda Cultural starts on 28th April, at the Taramati Baradari. This year's edition of the fest will have three programs on day one and two programs on day two. Noted musicians like city lad Karunya, flautist Pandit Ronu Mazumdar, violinist Kumaresh Ganesh, saxophonist Kadiri Gopalnath, percussionist Taufiq Qureshi, the Wadali Brothers and Begum Parveen Sultana will perform during the 2-day event, which also features a Hindi comedy play, Taj Mahal Ka Tender. 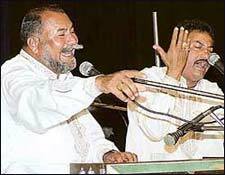 Today, the opening day, the Wadali Brothers will sign some Sufiana Qalaams, in the final performance of the day. The Wadali Brothers, Puranchand and Pyarelal Wadali, received their first musical training from their father, Thakur Das, at their ancestral village, Guru ki Wadali, in Amritsar. While deeply influenced by their Sufi faith, the brothers have branched out from qawwali and into Hindustani classical music, training under Durga Das and the great Ustad Bade Ghulam Ali Khan. They also perform various folk forms. In 1975, they were discovered by N M Bhatia, who brought them to the All-India Radio to record. In spite of their lack of interest in commercial success, the brothers got more and more recognition, which has led to the soundtrack work on films including 2003's Partition epic Pinjar. The brothers were awarded the Sangeet Natak Akademi Award in 1991, the Tulsi Award in 1998, and the Punjab Sangeet Natak Akademi Award in 2003. They have travelled to many countries and have always performed together. Practising music for years, these unassuming brothers now excel in almost all genres, from Sufi qalaam, qawwali and kaafi to bhajans, shabads and ghazals. The entry tickets are priced at Rs. 200 per head for the day's events. For further details, please contact APTDC at 2326-2151 or the venue at 2352-0172/2352-1884. Be the first to comment on Sufiana Qalaam By Wadali Brothers! Just use the simple form below. fullhyd.com has 700,000+ monthly visits. Tell Hyderabad what you feel about Sufiana Qalaam By Wadali Brothers!